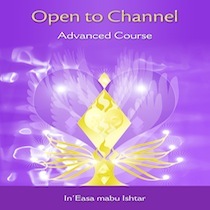 This school will no longer be taught by In'Easa mabu Ishtar, who has channelled all the material from the Ascended Masters and then taught it for 9 years. 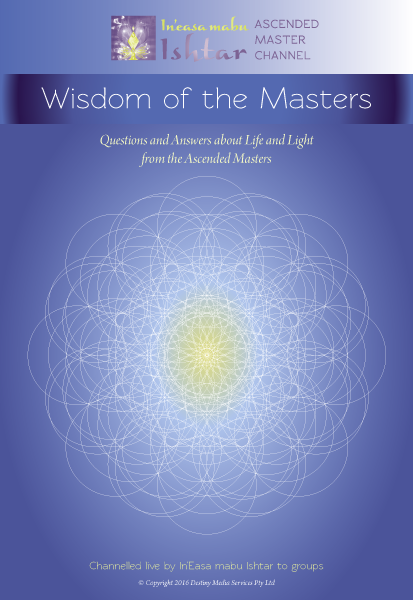 From 2018 Open to Channel is taught by those the Ascended Masters have chosen to be divine facilitators of this School of Wisdom. Please see below to find a teacher near you. New class starting March 13, 2019. We will meet weekly on Wednesday evenings 6.30pm-9pm. Long distance students via skype also available. (Payment arrangements can be made for the $1900 if necessary). Start Date: April 4, 2019. We will meet weekly on Thursday evenings 6.30-8.30pm for approximately 12 months. Long distance students via skype are also welcome. Cost: AUD$1800 this includes 3 Universal Ray Healings + material costs of $350 + 10% GST for Australian students (includes Open To Channel manual, audios, Personal Channel from the Masters & Australian postage). Payment arrangements can be arranged for the A$1800. Start Date: Wednesday 1st May, 2019. Frequency: Every Wednesday from 6:30pm - 9:00pm (Sydney Time). There will be a break in Dec/Jan. Long distance students via skype also available. New class starting March/April 2019. We will be meeting weekly. There will be two groups starting; one in French and one in English. Long distance students via Skype are also welcome. Cost: Swiss Francs 1'800.- this includes 3 Universal Ray Healings (payment arrangements can be made for the 1'800.-) + Swiss francs 350.- for manual, Personal channel from the Masters, audios and postage from Australia). Langue: Il y aura deux groupes qui commençeront: un en anglais et l'autre en français. Date de commençement: Mars-Avril 2019. Nous nous retrouverons une fois par semaine sur une année environ. Coût: 1'800.- francs suisses; ceci inclut trois séances de guérison par les Rayons universels (un arrangement pour le paiement est possible) + 350.- francs suisses pour le manuel, les audios, le message canalisé individuel et les frais d'envoi depuis l'Australie). New class starting March 20th, 2019. All other meetings will be held on Thursdays. This course may be longer than one year. Long distance students via skype also available. For more information contact Janet.